Barcode Warehouse only carries the best resin ribbons for use in TSC industrial printers that utilize a 1" core, 1476' ribbon. Our resin ribbons print at high speeds, up to 12 IPS, while maintaining high barcode and image quality. Resin ribbons feature superior resistance to chemicals, solvents and abrasion and a heat resistance to over 300°F. Compatible with TTP-246M Plus, TTP-2410M printers. The BCW Resin Supreme handles harsh chemical conditions and temperatures up to 350°F and is UL recognized. Product 4115160 is 2.50" x 1476' on a 1" core and has 6 rolls per case. 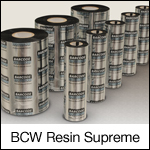 The BCW Resin Supreme handles harsh chemical conditions and temperatures up to 350°F and is UL recognized. Product 4115310 is 3.25" x 1476' on a 1" core and has 6 rolls per case. The BCW Resin Supreme handles harsh chemical conditions and temperatures up to 350°F and is UL recognized. Product 4115530 is 4.33" x 984' on a 1" core and has 6 rolls per case. The BCW Resin Supreme handles harsh chemical conditions and temperatures up to 350°F and is UL recognized. Product 4115560 is 4.33" x 1476' on a 1" core and has 6 rolls per case.